One of the smaller US states but also one of the most populous, Ohio is located in the Midwest United States, specifically in the Great Lakes region. The state has borders with Indiana, West Virginia, Kentucky, Michigan, and Pennsylvania, as well as bordering Lake Erie, one of the five North American Great Lakes. Unlike many other states that are split between multiple time zones, the state of Ohio is entirely in the Eastern Time Zone. Known under its nickname of The Buckeye State, Ohio is known for its indigenous buckeye trees as well as being a state that has consistently enjoyed success in the areas of politics, education, and sport. The state boasts a rich history of Native American heritage, being home to various tribes and indigenous nations over the years. Ohio was made a state in 1803. The biggest city in the whole of Ohio is Columbus, which is also the state capital. Columbus is one of the top 15 most populous cities in the entire US with a population of over 800,000 people. Other major cities located in the state of Ohio include Cleveland, Cincinnati, and Toledo. The state features plains, plateaus, and lots of rivers, and enjoys a humid continental climate with warm summers and cool winters. Due to its location and multiple borders, Ohio has always been seen as a key state for trade and transport. Lots of cargo passes through the state, which boasts one of the most developed highway networks in the entire US. In modern times, Ohio is seen as a prime state for start-ups to enjoy success, with the state enjoying unprecedented economic growth in recent years to the point where Ohio can now claim to have the seventh biggest economy of all fifty US states. The manufacture and financial sectors have proven to be key parts of Ohio's economy, and the state is popular with students too, boasting 13 state universities in total, as well as private colleges, medical schools, and more. Sport is a big activity in Ohio, with the state boasting professional teams in all major sports, including baseball, football, hockey, and basketball, with the Ohio State Buckeyes college football team being one of the most successful of all time. Before time zones were introduced to the United States of America, time could differ greatly from one town or state to the next. This was because people would use the sun to tell the time, setting their clocks to midday when the sun passed over the meridian. This system became problematic over time, especially when railroads needed to establish proper schedules for their trains. So, in 1883, four major time zones were laid out for the contiguous United States. The Pacific, Mountain, Central, and Eastern zones were introduced at this time, and the state of Ohio was entirely placed within the Eastern Time Zone. Ohio is one of seventeen states that are totally contained within this time zone, with some other examples including New York and Virginia. 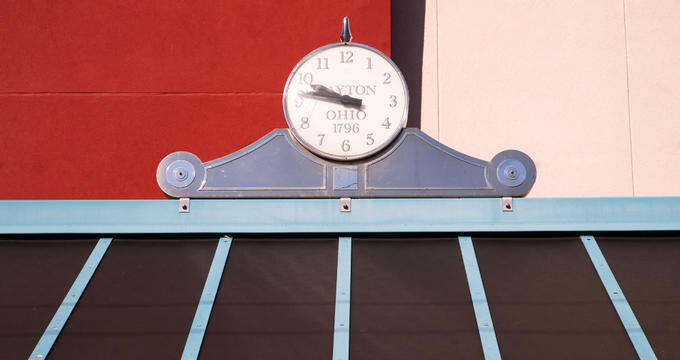 The Eastern Time Zone (ET) covers the whole of Ohio, as well as sixteen other states. It also applies in small to large parts of five other US states. The Eastern Time Zone covers more states than any other time zone and around half of the US population observe Eastern Time (ET). ET is divided into two forms: Eastern Standard Time (EST) and Eastern Daylight Time (EDT). EST applies outside of the summer months and is five hours behind Coordinated Universal Time (UTC-5), while EDT is four hours behind UTC and is used during daylight savings periods. Along with Ohio, the Eastern Time Zone also covers parts of Canada, one Mexican state, some Caribbean Islands, and parts of Central and South America. Due to the fact that it covers half of the US population and the country’s capital city, the Eastern Time Zone is regarded as the dominant time zone in the US and is usually the number one time zone listed by TV networks all around the nation. The entire state of Ohio, like almost every other state in the US, uses daylight savings time. Therefore, from the second Sunday of March through to the first Sunday of November, the state moves from EST to EDT, turning the clocks back one hour at the start and moving them forwards an hour at the end of this period. This system of daylight savings was introduced in 1966 and expanded with the Energy Policy Act of 2005.